Who can pass up a palette full of highlighters? I know I can't. This very fairly priced palette at $28 came up on Sephora's site a few weeks ago, and I tried to resist. But when I saw it in person while in NYC, I grabbed it. At first glance, I knew I liked 3 of the shades so I figured it was worth it. I like the sturdy plastic packaging with the see-through lid. I usually like a mirror, but it's also really nice to see what's inside. And the pans are big enough so you can swish around your brush. The product feels soft and smooth to the touch, and I couldn't help running home and comparing them to the Anastasia Beverly Hills Glow Kits. First, the pan size is almost the same as the newest ABH Glow Kit - the Ultimate Glow with 6 pans. And about half the size of the other Glow Kit pan sizes (not the Glow Child). There is 3.48g / 0.123 oz in each Sephora pan. There is 4.5g / 0.16 oz in each ABH Ultimate Glow Kit pan. There is 7.4g / 0.26 oz in each ABH Glow Kit pan. You can probably already tell that the middle shade in the Bottom Row is the standout of the palette. The others are not as pigmented and just a little chunky. The glow is there, but much softer than the ABH glow. Below I've inserted pictures of all the palettes so you have a reference. Above, clockwise from top left: ABH Gleam, Sun Dipped, Sweets, That Glow Palettes. OK! Now, here are some comparison swatches onto the back of my hand. First is #1 compared to Crushed Pearl in the ABH Gleam palette. 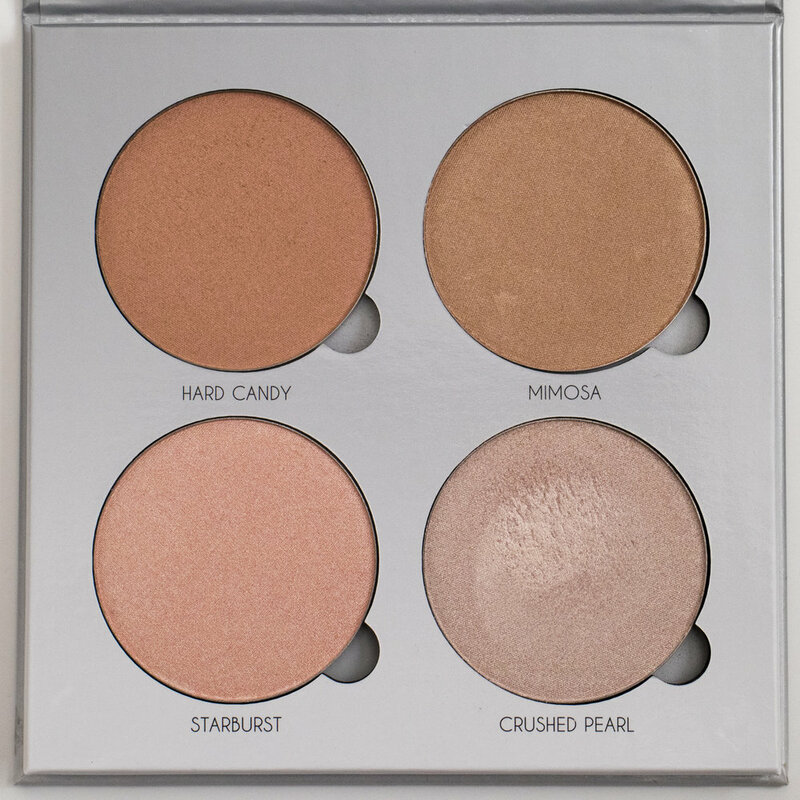 Next is #2 compared to White Sand in the Ultimate Glow Kit, Bubbly from That Glow and Butterscotch from Sweets. 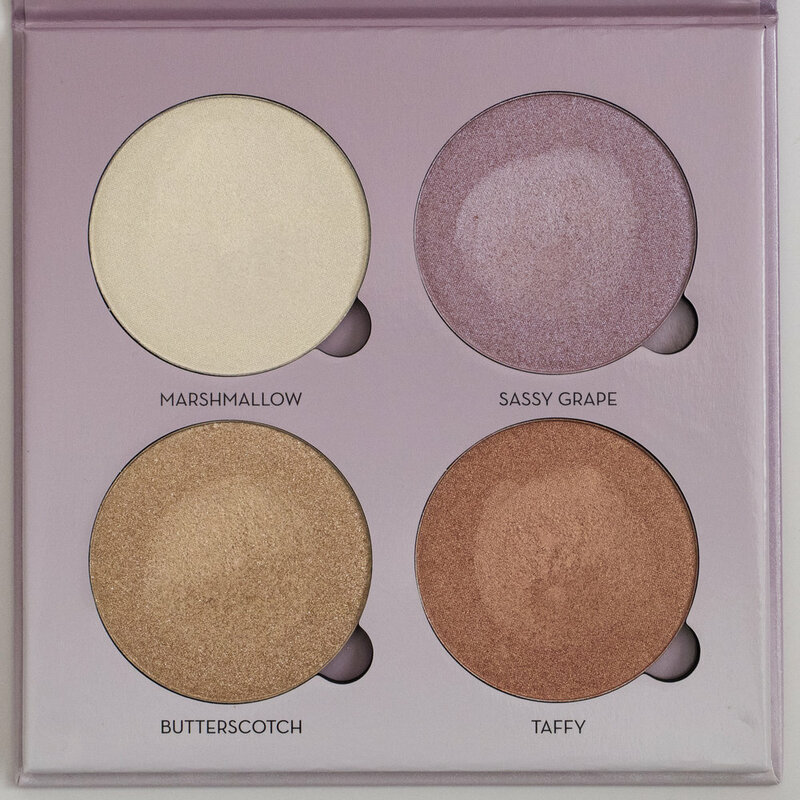 Next is #3 compared to Snow in the Ultimate Glow Kit. Next is #4 compared to Summer in Sun Dipped and Sunburst in That Glow. Last but not least, #6 compared to Sassy Grape in Sweets. As you can probably tell from the swatches (hopefully) is that these aren't quite as pigmented and rich in texture as the ABH Glow Kits. They are definitely decent, but closer in quality to the Ultimate Glow Kit which is a bit more chunky and powdery with less of a wet, foiled finish. All-in-all, if you don't have many highlighters this could be a nice palette with a good assortment of shades. But if you're a highlighter junkie, like myself, this may not be a must-have. The quality is definitely OK, just not the best, but the price point makes up for it. Hope that helps!